To support our recipients (On-boarding Partner, OBP Connection Provider, National Medicines Verification Organisations) during her On-boarding Process, we release the latest versions of our On-boarding Guides, as well as additional information, here. 1.01 Do you have a glossary of all the abbreviations? To get in touch with all the used abbreviations, please use the following table. The EMVO Glossary is also available in our Documents Overview. EMVO Glossary. What is an OBP? What is an MAH? The OBP is the contracting partner of EMVO and concludes the Participation Agreement. The OBP is legally authorized to sign on behalf of a MAH / a group of MAHs. The OBP has to be affiliated to a MAH / a group of MAHs. “Affiliate means, in relation to a Party, any other entity Controlling, Controlled or under common Control with the Party. "Control" and its derivatives mean either the holding, directly or indirectly, of 50 % or more than 50% ownership interest or the statutory or de facto authority to exercise a decisive influence on the appointment of the majority of directors or managers or the orientation of policy provided it is, at EMVO’s own absolute discretion, sufficiently proven”. OBP Affiliate(s) agree(s) in writing to be bound, jointly and severally with the OBP, by and to observe all terms, limitations and conditions applying to the OBP as set forth in the Participation Agreement. The group of MAHs represented by the OBP either consists of Original Pack Manufacturers or Parallel Distributors. 1.02 How are Delegated Regulation and the new rules on medicine verification of the European Commision implemented? To facilitate the implementation of the Delegated Regulation and the new rules on medicine verification, the European Commission has prepared a “Questions and Answers” document. 1.03 What are the penalties for failure to comply with the deadline of February 9th 2019? The European Medicines Verification Organisation is neither authorized nor in the position to state or determine the consequences and penalties for failure to comply with the deadline of February 9th 2019. Please contact the European Commission for further information. 1.04 Does EMVO fulfils the quality requirements to facilitate the medicines verification process? We understand the need of OBP’s to obtain a level of certainty that EMVO fulfils the quality requirements to facilitate the medicines verification process. EMVO asked EDQM to act as their external auditor to ensure that the European Hub is designed, managed and operated in accordance with the standards as described in the “Commission delegated regulation (EU) 2016/161” supplementing the Directive 2001/81/EC and other relevant state of the art standards. Together with EDQM, we agreed on a strategic audit plan which will allow the EMVO organisation to meet the quality expectations by February 2019. The first audit has already been executed on January 19th 2017 and during the last week of April 2017. Further audits are planned for end of 2017, and in 2018. We would also like to inform you that the Belgian NCA is part of the audit team as they will supervise the EU hub. Also on European level, a sub-group within the EC Expert Group was formed to develop an Aide Memoire for National Competent Authorities as a guidance document to supervise national medicines verification organisations (NMVOs) and their systems (NMVS). We decided to extend the audit team with an observer to represent this workgroup. With regards to security, EMVO also ensures a yearly external security audit on the EU Hub. This audit is managed by an external independent company. As EMVO strives to full transparency on its EU Hub system and processes, we will therefore provide you as OBP the full Audit Report, as currently available, after a check of your legitimacy. To get the report, please request it from the EMVO Helpdesk. The Directive 2011/62/EU and the Delegated Regulation (EU) 2016/161 are also available in our Documents Overview. 1.05 Where do I have to on-board as a wholesaler? Wholesalers have to on-board at national level, to the National Medicines Verification Organisation(s) of the countries they have wholesale license(s) in. Further information for wholesalers is available on the Supply Chain and Medicines Verification: website here. 2.01 What is a Parallel Distributor? The Parallel Distributor does not hold a marketing authorisation in the terms of Community law. Instead, the parallel distributor/importer is holder of either specific product authorisations issued by national competent authorities in an abbreviated procedure or holder of an EMA distribution notice. The national authorisations may be regarded under the respective national rules as « marketing authorisations » and the holder of such authorisations, for example in Germany, is a pharmaceutical entrepreneur comparable in legal status to any pharmaceutical manufacturer. In the case of centrally approved products, the product can by definition circulate in the entirety of the EEA market; when it is commercialized by a parallel distributor, the EMA only issues a so called « distribution notice » to this distributor. In addition, parallel distributors must repackage the product which they handle in order to comply with the labelling and other regulatory and trademark requirements of the destination market, and repackaging is a manufacturing activity regulated by GMP. The FMD correspondingly speaks of „manufacturing authorisation holders“ when it means on the one hand marketing authorisation holders and on the other parallel distributors. For these reasons, parallel distributors connect to the hub, comparable to other (normal) manufacturers. 2.02 What is an OBP? What is an MAH? The concept of On-boarding Partner (OBP) has been defined in order to facilitate the On-boarding process for corporations to the EMVO. The OBP company represents the companies holding marketing authorization among its corporation. The Marketing Authorisation Holders the OBP represents and will upload data for in the EU Hub have to be the OBP’s affiliates. A corporation can decide which legal entity will act as its OBP. 2.03 For whom can the OBP upload product data? The OBP can upload data only for its affiliated MAHs. 2.04 Who is the OBP in the situation of “co-marketing”? Company A produces as CMO for B but also sells theselves. Company B has no own production. In conclusion, A would be the obvious OBP, also because only they have the repository system. But A and B are completely seperate legal entities, not parts of the same group (though they have a commercial agreement in place). Could A (who will need to On-board as OBP for their own products) also be actiong on behalf of B? Even though A is actually the CMO, not the brand owner for the products of B. No. Company A can’t act on behalf of Company B, because they are not affiliated to each other. 2.05 What is the difference between Original Pack Manufacturer and Parallel Distributor? For the purpose of the FMD, which is addressed to "manufacturing authorization holders", or "manufacturers", we have designed technically different interfaces for original pack manufacturers and parallel distributors. Parallel distributors base their master data in part on pack data issued previously by originator companies. It is therefore strictly necessary to distinguish the type of company before applying to connect to the EU Hub. The Original Pack Manufacturer is a pharmaceutical company holding a marketing authorisation (MA) and is placing medicines on a given market. In the context of batch release the company uploads product codes and pack data into the EU Hub. The Parallel Distributor or Parallel Import company is an independent company purchasing medicines in one market and – after repackaging - placing these medicines on a different market (the market of destination) under a license obtained under its name from the National Commitment Authority (NCA) of the destination market (parallel import license) or of comparable permits issued by European Medicines Agency (EMA) for centrally approved medicines (EMA parallel distribution notice). Parallel distributors must repackage the product which they handle in order to comply with the labelling and other regulatory and trademark requirements of the destination market; this constitutes (partial) manufacturing and is subject to a manufacturing authorisation. 2.06 Marketing vs. Manufacturing Authorisation Holder? When EMVO uses the abbreviation MAH, we ONLY use it in relation to Marketing Authorisation Holders. A Marketing Authorisation Holder is the organisation which owns the serialisation data and which is accountable for uploading the date to the EU Hub (e.a. XYZ Sales Company in EU member country). Possibly an affiliate of the OBP; for smaller companies the MAH and OBP could be the same. Both the manufacturing of pharmaceuticals according to the requirements of its marketing authorization and the repackaging of finished goods (which is the activity of parallel distribution) are subject to GMP rules and require a manufacturing authorisation. Both types of company are thus connected to the EU Hub but using different interfaces. The FMD correspondingly speaks of „manufacturing authorisation holders“ when it means on the one hand marketing authorisation holders and on the other parallel distributors. Parallel distributors connect to the hub, comparable to the other original pack manufacturers as they place “new” repackaged medicinal products on the market. 2.07 Is the Participation Agreement confidential? No, the Participation Agreement (PA) is not confidential. 2.08 Should an On-boarding Partner (OBP) sign a dedicated Participation Agreement (PA) for each Marketing Authorization Holder (MAH) or could the OBP sign one PA at group level that covers all MAHs? One PA per Corporation/Group signed by the OBP who represents the MAH’s of the corporation is sufficient. 2.09 When is the On-boarding Partner (OBP) required to sign the Participation Agreement? The Participation Agreement will be signed after the company information is filled in and the Authorised Representative is appointed. 2.10 Is there a declaration or an official position that endorse the statement “NO CONTRACT NEGOTIATION”? The Participation Agreement is NON-NEGOTIABLE, only in case of contradicting national law. 2.11 What is a Copy of Proof? A copy of proof consists in an objective document attesting that the Authorised Representative has the authorisation to sign on behalf of the company and therefore to legally bind it. For example, it can consist in an excerpt of the Trade Register, an excerpt of the Bulletin of Act or of the status of the company, in order to certify the position of that person in the management board or in a senior position. It is needed in order to enable us to approve the Participation Agreement you would be required to send us as well as to further pursue the legitimacy check. Please find here the list of National Registers for obtaining the Copy of Proof. 2.12 Which information on the invoicing form is obligatory vs. optional? Please have a 2nd look on the invoicing form from step 2.5 in the OBP Portal. The obligatory fields are marked by an asterisk (Legal entity name, Address, E-Mail Address, Number of MAHs, VAT Number). All the other details are optional. 2.13 What are National Customer Number and Customer Number? The National Customer Number is a customer code that the local commercial entity belonging to the OBP has with a local organisation from which they have to obtain specific product references. Therefore, the OBP will be asked to provide that number only if it also acts as an MAH. Such numbers are IFA in Germany, or CIP in France, for example. It may also be that some countries don’t have such number, or that the OBP do not act as an MAH and therefore the OBP don’t have to fill that part in. 2.14 What is a Company Registration Number? A company registration number (CRN) is a unique combination of numbers, at times of numbers and letters. It is used to identify a company and verify its legal existence as an incorporated entity. A unique Company Registration Number is assigned as the company is registered on a certain register. The issuing entity differs from country to country. In Germany the public register and issuing entity is the Handelsregister. In the UK it is the Companies House. The CRN can be found on the Certificate of Incorporation, on all official documentation received from the issuing entity or on the excerpts of the register. A company registration number is also referred to as ‘company number’. 2.15 How to fill in MAH and Product Information as Parallel Distributor? The parallel importer, or distributor, does not hold a marketing authorisation in the terms of the Community law. Instead, the parallel importer is holder of specific product authorisations issued by national competent authorities in an abbreviated procedure. These national authorisations may be regarded under the respective national rules as « marketing authorisations » and he holder of such authorisations is, for example in Germany, a pharmaceutical entrepreneur comparable in legal status to any brand manufacturer. In the case of centrally approved products, the product can by definition circulate in the entirety of the EEA market; when it enters parallel distribution, the EMA only issues a so called « distribution notice ». Therefore EMVO kindly asks you to fill in your legal entity which a minimum of one and a maximum of three relating licenses in step 3.8 of the OBP On-boarding Portal. A full list of all the relating licenses will be requested when entering the technical on-boarding. 2.16 Where can I find the payment terms (besides the Appendix 2)? The terms are not further detailed. After the Participation Agreement is signed the On-boarding Fee can be paid. Latest before getting connected to the HUB test environment the fee has to be paid. 2.17 What’s the amount of the On-boarding Fee? To cover administrative connection costs, including the cost of the legitimacy check, EMVO charges a one-time On-boarding fee. Therefore, due to the fees adjustment over time, an application of 50% rise in the amount to be invoiced to the OBPs was applicable from the 15th of January 2018. An additional 50% rise was applied from the 15th of June 2018. Since the release of the Participation Agreement for the Operational Phase, the fees are fixed for all OBPs as displayed below. 2.18 What is included in the On-boarding Fee? The On-boarding Fee is a one-time fee which covers the administrative costs related to the On-boarding process, the costs attached to the legitimacy check and the technical costs of connecting the On-boarding Partners (OBP) with all its MAHs to the EU Hub. The On-Boarding fee is fixed independently from the countries in which the MAHs are active and/or registered. To consult the latest applicable On-boarding fees, please check the FAQ 232, or contact our Helpdesk. What’s the amount of the On-boarding Fee? 2.19 Will the operational phase be followed by additional costs/yearly maintenance? No, not from EMVO side. The National Medicines Verification Organizations will ask for the yearly Flat Fee. 2.20 Who is the Authorised Representative? The Authorised Representative (AR) is appointed by the OBP. The AR should be a senior officer who is authorised to sign on behalf of the company, the person holding the position of CEO, CFO, CIO or a member of the management board. Only the named AR is able to sign the Participation Agreement in name and on behalf of the OBP company. The AR will confirm that the SPOC is a legitimate person who has the authority to manage the project in name and on behalf of the OBP. The full name of the AR is provided, without translation nor abbreviation, as it appears in the national register. 2.21 What is a SPOC and SPOC assistant? The SPOC is the key contact person for EMVO and is authorised by the Authorised Representative to be in charge of the correspondence between the OBP and EMVO. The SPOC is responsible for providing the requested information for the OBP on the On-Boarding Partner Portal in order to establish a connection with the EU Hub. The SPOC can appoint a SPOC Assistant as a back-up. This is optional. 2.22 What is the difference between Parallel Distribution and Parallel Importation? Centrally authorised medicinal products (“CAPs”) put on the market of one Member State can be marketed in any other Member State by a distributor, independently of the original marketing-authorisation holder; in this case we speak of “parallel distribution”. The parallel distribution (PD) pertains to all centrally authorised products, and the European Medicines Agency (EMA) issues a "distribution notice" to the parallel distributor. The parallel import on the other hand concerns only nationally approved products and is authorised by the national competent authority of the Member State of import based on two conditions: that the medicine in question has a marketing authorization in the country of import as well as in the country of source, and that the medicine to be imported is therapeutically similar to the product distributed in the Member State of destination by the marketing-authorisation holder. For simplicity, we use for both activities the term "Parallel Distribution". 2.23 What is the difference between the connection of an Original Pack Manufacturer to the Hub and the connection of a Parallel Distributor/Importer to the HUB? The Connection of an Original Pack Manufacturer allows to upload original pack data to the EU Hub. The Parallel Distributor (PD) acquires already batch released products, which are then repackaged and subject to a subsequent batch release under his authority; prior to repackaging the PD must verify and decommission the serial numbers. In addition, and according to DR Art. 36 (n) the parallel distributor has to establish a link between inbound and outbound batches, which is another reason why the interface to the EMVS is different for parallel distributors compared to other manufacturers. The FMD correspondingly speaks of „manufacturing authorisation holders“ when it means on the one hand marketing authorisation holders and on the other parallel distributors. 2.24 How to on-board (a) MAH(s) separately though having a registered OBP, which on-boards MAH/s? It is possible to on-board (a) MAH(s) separately though there is already a registered OBP. A MAH or MAHs can on-board separately, registering and on-boarding as or under a separate OBP. However, EMVO will apply the on-boarding fee depending on the amount of MAHs per OBP. Moreover, please note that in general one MAH can only be associated to one OBP. Only in the case of a hybrid company (one entity with both company types), a double application of an MAH to two separate OBPs is possible. Please note that regarding the company type a separate on-boarding of MAHs under a separate OBP also might be necessary as an OBP can either only represent Original Pack Manufacturers or only Parallel Distributors! 2.25 Why it is important and how to fill in the Company Type? As the connection of the Original Pack Manufacturer and Parallel Distributer differs (please see FAQ 2.05), and therefore an OBP can either only on-board Original Pack Manufacturer or only Parallel Distributers, your company is requested to provide EMVO with the information about your company type in Step 1.1 ‘Company Information’ in the OBP Portal. This information is of paramount importance as it determines the type of connection your company will be using in the European Hub. a) If the MAH(s) are original pack manufacturer(s) only, the original pack manufacturers can choose one common OBP to represent/onboard them. b) If the MAH(s) are parallel distributor(s) only, parallel distributors can choose one common OBP to represent/onboard them. c) If some MAH(s) are original pack manufacturers and some are parallel distributors, the parallel distributors choose one common OBP to represent/onboard them AND the original pack manufacturers choose another common OBP to represent/onboard them. d) If there is only one MAH/entity which will on-board, but it has both company types so is an original pack manufacturer and parallel distributor (Hybrid company), please contact the helpdesk for further guidance. 2.26 How to set up the coding for the different countries? The product codes to be uploaded in the EU Hub have to follow the coding requirements of each country where the product is marketed. The list of coding requirements per country can be consulted from the EMVO website, in the Knowledge database section. 2.27 How to fill in the Product Master Data and Product Batch/Pack Data in the EU Hub? Which information to include? Please consult the Master Data Guide, also available on EMVO website. The key data fields have to be filled-in according to this guide (Product Code and Coding Scheme (in EMVS), Data Carrier Identifier (in SPOR) which is equivalent to the Product Code in EMVS, ISO Country Identifier for each market of intended sale). In the Market Specific Master Data section, for each market within a multi-market pack the given table should be completed. For single market packs only one completed table is required. 2.28 We have already signed the original Participation Agreement (PA), do we need to sign the PA published in November 2018? Yes. As mentioned in the related Letter of Announcement, the new Participation Agreement governs the Operational Phase of the EMVS, meaning the full-scale operational mode of the repositories system. The previous Agreement covers only the period until the 9th February 2019, meaning the Implementation Phase, and expires on that day. Therefore, all OBPs need to sign the new Participation Agreement. However, this time no hardcopy of the Agreement will have to be sent by you to EMVO. You will only be requested to upload the signed Agreement via your account on the Portal and EMVO will exchange in the same way its countersigned scanned copy. 2.29 Where can we find the new Participation Agreement? If you have already signed the previous Participation Agreement (for the Implementation Phase), then the new template is available on Step 5 (“Maintenance”). If you have not signed the previous Participation Agreement (for the Implementation Phase), then the new template is available on Step 2 (“Detailed Information and Participation Agreement”). 2.30 We are the OBP and the MAH, do we need to sign a Letter of Adhesion? The purpose of the Letter of Adhesion is for the MAH to adhere to the Participation Agreement between EMVO and the OBP it uploads data for on the EU Hub. If your organisation is an OBP and MAH at the same time, then you are already bound by the Agreement as EMVO's counterparty and no further action is required, except, of course, for signing the new Participation Agreement and uploading a scanned copy thereof on the Portal. 2.31 How to on-board (a) MAH(s) separately though having a registered OBP, which on-boards MAH/s? 3.01 What does the “Legitimacy Check” include? How this is done? What are the requirements to be met by OBP? In order to keep the Legitimacy Check as effective and secure as possible EMVO does not publish the procedure. The check will be based on the information EMVO receives from the On-boarding Partner during the on boarding process. As soon as the process starts, EMVO will request all relevant information via the EMVO On-boarding Portal. 3.02 Will the given access rights be checked by EMVO / SolidSoft Reply? Access will be given to the production environment of the EU Hub by EMVO (not by Solidsoft) and only to legitimate On-boarding Partners. The details of participation are stipulated in the Participation Agreement. 3.03 When shall I provide EMVO with a complete list of the MAH for which I will upload data? The On-boarding Partner will be asked to provide EMVO with a list of MAH on the OBP Portal. For the purpose of the legitimacy check, the OBP is asked to provide, in step 2.7 the information of a minimum of one MAH, maximum of three, and a minimum of one product, maximum of three of each MAH. In step 5 – Maintenance, the OBP is requested to fill-in the full list of MAHs for which it is willing to upload date in the EU Hub. Please note that no further information on products are required in step 5 as it is only needed for the legitimacy check purposes. The number of MAHs listed has also to be reflected in the Invoicing Information Form accordingly and adapted in Step 5 if necessary. 3.04 Shall I go through the Legitimacy Check even if I already signed the contracts with EMVO before the portal was released? The Legitimacy Check is an inevitable step in the on-boarding of the On-boarding Partner. Without notified successful findings of the Legitimacy Check, no access will be granted to the Technical On-boarding. The OBPs that already signed contracts with EMVO are also asked to go through the portal. However, they will have the possibility to upload the contracts they already signed directly in the portal. 4.01 Who are the registered Connection Providers (Gateway Providers)? Download the and the . 4.02 What is an OBP Gateway Connection Provider? An On-boarding Partner (OBP) Gateway Connection Provider is a third-party contractor engaged by the OBP, who assists in whole or part of with the development, implementation, provision, use and/or operation of the OBP interface to the EU Hub via a Gateway Connection. Every OBP Gateway Connection Provider has to be promoted by at least one OBP in the On-boarding Process. 4.03 Can I purchase a Direct Connection as a module of my existing IT System? Yes, your IT software supplier may decide to offer a module off-the-shelf to allow your existing IT System to connect with a Direct Connection to the EU Hub. 4.04 What should I fill in in the field “Name of Gateway Provider”? The Gateway provider is the provider of a Gateway connection to the EU Hub. You have to decide with whom you want to connect. For example, if you choose for the EMVO Gateway connection, you complete this field with “EMVO Gateway”. 4.05 Is a regular provision of respective ISO 27001 certificates in place and is this covered by the contract between EMVO and manufacturers? Solidsoft Reply is ISO 27001 certified. EMVO does not deem it necessary for each manufacturer to also be ISO 27001 accredited. 4.06 Will manufacturers be informed in case of incidents related to their data (network intrusion, loss of data etc.)? If no assessment can be made whose data is affected, will all manufacturer be informed? Yes, Manufacturers will be informed. 4.07 Are there requirements to the hardware and the internet connection of the local organization? Do we need to have a static IP address? Is VPN communication with the HUB going to be established? No, there are not any hardware requirements in the form of a list. Your chosen service provider will already be aware of the security requirements and the need for a fixed endpoint. VPN is not used. 4.08 I have to name the client for the connection details. What information of the client is needed here (e.g. the DNS or the IP address of the server)? Or is it simply our company? We offer you to define your name for the client. You should use your company name suffixed by the gateway provider or 3rd party provider name. This allows to easily identify your client connection with the European Hub such that for future maintenance or even disconnection requests, we can be certain that any amendments are made to the correct instance. 4.09 In the EMVO connection details, I have to define the connection type – and the connection technology. For both connection types (direct- or gateway), Java or .NET can be chosen. Can we also opt for another technology? EMVO can only provide support for clients using one of the technologies we have specified and any deviation from this may entail additional costs which will have to be borne by either the connection provider or the On-boarding Partner. 4.10 Batch information included in pack data. –> Batch information (in EU Hub) required prior to pack data upload? No, you send it with the pack data unless you use the current EMVO Gateway in which case you send it first. Next revision of the EMVO Gateway will also take the batch information at the same time as the pack data. 4.11 Batch upload before sending packaging data or is a batch automatically created by sending serialization data? Almost, you state the product code, batch and expiry as part of the pack upload process and the batch header information is created from this data. You don’t apply these they happen automatically on upload and are set to Active. Subsequently however you will be able to set a batch recalled. 4.13 Distribution of Serial Numbers batch-related -> release per batch or per process order? Entirely your choice, we don’t insist on one model or the other but remember that the serial numbers are unique to the product code not only the batch. 4.14 How and when is a data input by OBP to the EU Hub available to National Systems? When the OBP sends data to the European Hub it is propagated to the relevant national systems almost immediately. 4.15 Is the inputted data to each environment of the EU Hub available in the National Systems? No. Only the production system is guaranteed to be connected to real national systems. ITE always uses simulated national systems, IQE may use a mix of simulated and real (but integration versions) national systems. You will have to enquire when ready to send data to determine if the market you wish to communicate with is truly connected. No. National Repositories will follow a different path. Your provider (whoever that is) will have a support contract with SolidSoft Reply (EU Hub) and as a result will have a development and test environment all of their own. Integration tests will be performed there and then transit to our IQE for certification testing – then to Production. 4.17 Are you planning to migrate data from one to another environment? No. We are absolutely not planning any data migration from any environment. 4.18 Is there any document that could help understanding the data trip during the setup? Yes. There is a slide presentation available to this topic. The presentation is currently in a draft stage. As soon as the work is completed the presentation will be available in the EMVO Download Section. 4.19 Can a company decide if it prefers to have a separate connection for each of its MAHs to the EU Hub instead of assigning only one connection? In general, No. EMVO allows in maximum two connections to the EU Hub per OBP. (i.e. 1 direct + 1 gateway; 2 gateway). Technically there is no restriction on the order of the data elements within the code beyond that the GTIN/Product code is first. However, there are recommendations in the GS1 standard so they would be advised to read this. Put all the fixed length fields first (expiry) and always end with a variable length field (lot or serial) this way you minimize the code size. 4.21 What is the EMVO Gateway? Essentially the EMVO Gateway is an alternative means of connecting to the European Hub (alternate to developing a direct connection, or other Gateway Provider solutions). The direct connection will suit many OBP’s however it is complex to realize. The EMVO Gateway provides an easier way to connect to the EU Hub using typically understood techniques and is aimed at those OBP’s who want to participate in pilot programs but do not yet have a direct connection established or smaller OBP’s who have no need for the direct connection because their volumes of batches are much lower. It’s highly manual in operation so not well suited to automated processes, however it is a very effective means for connecting easily with the European Hub and wider EMVS. 4.22 What is the definition for “in-house”? Essentially used in the context (from the larger query set), this means made by you internally within your own organisation. Where you have your product made is for you, the legal and contractual responsibility for the data produced and uploaded remains 100% with you as the contracting party. We do not support the connection or 3rd parties directly to the European Hub to act on behalf of another party. 4.23 Are GTIN or other standards codes mandatory during the On-boarding procedures? The EMVS supports both the GS1 standard and the IFA PPN standard and doesn't provide benefit either way. However, the GS1 standard does provide measurable supply chain benefit for all stakeholders and is much the preferred option. 4.24 I have issues to access the OBP portal. What should I do? If you receive the following error messages access denied or request access, you are most likely using either a wrong account or the wrong link to the OBP Portal. For that reason, we recommend you to always refer to the login information that you received in the e-mails sent by noreply@emvs.com to access your OBP Portal account. If, nevertheless, you still receive an error message of that kind, please try to access your account through a Private/Incognito window before contacting the Helpdesk. This could solve the issue since it is related with the cache stored in your browser. Please make sure that you key in your OBP Portal account with the right credentials (received from noreply@emvs.com) for the first time. This will prevent many possible issues related to your connection to the OBP Portal in the future. 4.25 I have continuous problems with Product Data upload to the EU Hub. What should I do? EMVO wants to ensure that all OBPs receive the most accurate and up to date information in the most efficient way. To receive the information with regards to all known problems within the EMVS, EMVO strongly recommends to subscribe to the EVI (European Medicines Verification System Information) Alerts for the specific systems you are interested in. In case your incident does not seem to be one of the ones described, we kindly request that you fill in the following form and send your request to our helpdesk (helpdesk@emvo-medicines.eu). Please ensure that you send us the failed call-back (if available), as well as the Correlation ID and Timestamps written, rather than attaching screenshots. 4.26 How to access the EMVO Gateway? This action should be taken before the OBP reaches the step “Request session token” in IQE or PRD environment in Step 4 of the OBP Portal. b) The credentials and URL to the EMVO Gateway portal will be sent to the SPOC through the following email: noreply@meliorsolutions.com (please be aware that it might appear in your Junk folder). c) The SPOC receives the information pack to complete the EMVO Gateway connection. 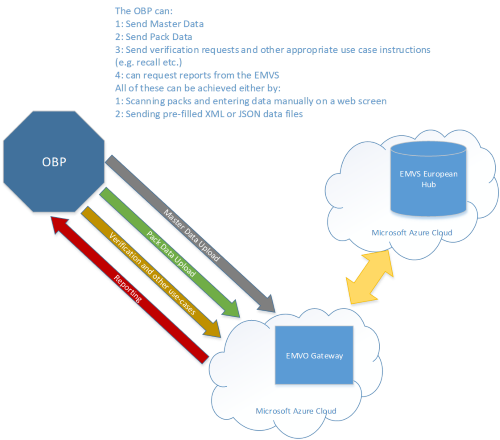 The EMVO team generates and uploads a Session Token in the OBP Portal for the requested connection. To be able to access the EMVO Gateway portal properly, the SPOC will be advised, via email, on the next steps to complete the connection. 4.27 What is Retrospective Upload and when should I use it? In order to have the Product data properly linked to the Master Data, the OBPs have to use ‘Retrospective Upload’ functionality. The ‘Retrospective Upload’ functionality is only relevant for multi-market products where not all associated National Medicines Verification Systems (NMVS) are live yet. In this way, OBPs will be able to upload their serialized data to all National Medicines Verification Systems where their products are marketed. For further details on the ‘Retrospective Upload’, please consult the document uploaded on the OBP Portal, in the Technical Info Pack section. The document includes questions and answers and describes scenarios of uploads performed before and after the release 1.4 of the EU Hub. 4.28 How, as a Parallel Distributor, do I upload Pack Data in the EU Hub when no serial code is available in the physical pack? For the particular case where a Parallel Distributor/Importer uses the EMVO Gateway and buys products which are not yet serialized, EMVO recommends to create a dedicated GTIN/NTIN/PPN owned by your OBP, as a placeholder to fill in the field "Original Product Code" for all Original products which are not yet serialized. Please be aware that this product code should not be used for any product you currently sell or will sell in the future. 5.01 What is the Maintenance mode? Who can proceed to the modifications in that step? 5.02 Would I be able to modify all information of the Contractual On-Boarding Part? The OBP can maintain MAH information already provided in Step 2.7. For the purpose of the Legitimacy Check, the OBP was required to provide MAH and products information in step 2.7. However, in Step 5 – “Maintenance”, information on products is no longer required. Still, the OBP is requested to provide EMVO with the full list of the MAHs it will be willing to upload data for in the EU Hub. This list has to be complete and updated according to any change. All detailed company information, except the company type, can be updated. The OBP can also modify the SPOC and the SPOC assistant contact details. The OBP can view and/or download the latest Participation Agreement applicable. Whenever an updated Participation Agreement will be made available, the OBP will be requested to sign the new version of the contract and follow the procedure accordingly. The Invoicing Information Form can be viewed or downloaded. In case more MAHs are registered in the OBP Portal than mentioned on the already approved Invoicing Information Form, the Invoicing Form will be rejected in order for you to restart the invoicing process. 5.03 Is another Legitimacy check going to be performed on the newly provided information? No. Once the Legitimacy check is passed in Step 3 the modification of information in Step 5. Maintenance will not trigger a new Legitimacy check. Still, all information will be randomly checked in the aftermath in order to ensure that the MAH listed in Step 5 are all affiliated to the OBP company. 5.04 What should I do in case my OBP/MAH is facing MAH transfer or D&A/M&A activities? Please notify EMVO in good time as soon as your OBP, Company or MAH(s) face(s) one of the following scenarios. Please do so by contacting the EMVO Helpdesk (helpdesk@emvo-medicines.eu), providing the following information (if applicable). - Which scenario do you face? - How many entities are involved and which? - Who is the Acquirer/New Owner & who is the Transferor/Old Owner? - How many OBPs are involved and which? - What is the planned timeframe? / When is the action taking place? - How many SKUs/Product Codes (PC) are affected? - Was data uploaded for the affected SKUs/Product Codes (PC)? o If yes, for which SKUs/PC? o If yes, Product Master Data (PMD) and Product Pack Data (PPD)? - Who will be the responsible contact person(s)/representative(s) of both parties? 6.01 Do you provide the EMVS Master Data Guide as download? Yes. The EMVS Master Data Guide is available in our Documents Overview. 6.02 Is aggregation upload possible? Is there a chance to benefit from a more detailed data set by sending aggregation? No. Not possible and thus no potential benefit. 6.03 How codes will be uploaded when multi-market packs are destined for two markets – one of which does not yet have an operational Repository? The EMVS Master Data Guide is available in our Documents Overview. The Questions and Answers Document, published by the European Commission, also gives a helpful answer to this topic. Regarding this, we would like to refer to question 1.12 (Would it be possible to place a unique identifier on the packaging of a medicinal product during the 3 years period between the publication of Regulation (EU) No 2016/161 and its application?) of this FAQ from the European Commission. 6.04 Is it possible to deliver a serialized product from country A to country B when this product is not registered in country B? If products are sold by exceptions in countries where the products are not registered, the EMVS will allow for a verification process though with very slow performance. Therefore we strongly recommend to use the multimarket pack approach which means you’ll need to upload the Product master data in the NMVSs of country A and country B. 6.05 How is the EMVS testing the randomness of Serial Numbers (UID)? The EMVS, consisting of the European Hub and the National Systems, implemented a level of testing to check the level of randomisation of serial numbers supplied by each OBP. The Delegated Regulation (Article 4) clearly states that the serial number has to be random and places some definitions about how random the values should be for a given product code. To provide a sense-check, the EU Hub implemented some tests on the randomisation of serial numbers for every file of Product Pack Data (PPD) which is uploaded to the EU Hub. This might trigger a warning which is sent to the OBP, informing them that the numbers may not be sufficiently randomised. At this moment, EMVO plans to adapt the randomisation test algorithm in the next release of the EU Hub and have randomisation tests implemented in the National Systems. This should result in less warnings to OBP’s. When the tests are implemented by the National Systems, all serial numbers ever uploaded for a specific product, can be taken into account. At all times, OBP’s should be aware that it is not a warranty that the generation method used is sufficiently robust when no error message has been received. The testing undertaken by the EMVS only ‘weeds out’ those that fall well below the standard required. EMVO is not an authority of the use and construction of suitable algorithms to produce serial numbers of a sufficient random nature. OBP should research the recommendations of NIST (National Institute of Standards and Technology). 6.06 What is to be done if the original batch number is longer than 20 characters? An inbound product suitably coded for the European market under the terms of the FMD Delegated regulation cannot have a batch ID greater than 20 characters – the coding schemes simply do not support this. 6.07 How is the process to connect the batch data (section 5.1) with the article master data (section 3), if someone has to upload the batch data and the pack data more frequent (different batch numbers to the same article number). This Question relates to the EMVS Master Data Guide. The batch data is associated with the master data by means of the product code. Each batch (which includes the pack) data upload will contain the product code (article number), batch ID, Expiry date and list of serial numbers (plus of course the MFR details). Thus, the product code is used as the common field between master data and batch data. The EMVS always uses the product code as the key field and the Hub makes the connection for you. Parallel Distributors do also have to load the old product code and batch information so that the Hub can discharge its requirements under Article 35(4) in the DR. They can also upload new outbound batches (all different if needed) to the Hub and so long as they specify the original product code and original batch ID, the Hub will allow multiple batches up to the limit imposed by the original decommissioning. 6.08 Does the strength and pharmaceutical form need to be added to the Registered Product Name to form the Name of the Medicinal Product? This question is related to one of the common data elements in the EMVS Master Data Guide (Appendix 1), Name of Medicinal Product. Does the strength and pharmaceutical form need to be added to the Registered Product Name to form the Name of Medicinal Product, if this Registered Trade Name not includes the strength and pharmaceutical form? This Registered Trade Name is more appropriate for the ‘common-name’ entry and not for the ‘name’ field. According to our investigations, the name should be followed by the strength and form information as indicated in the guidance document by reference to SmPC rev. Ultimately however this is only guidance – you should seek detailed clarification from the regulator responsible for the market(s) on which your product is sold as EMVO is not a regulatory authority and this data is not used within the EMVS (currently) for any other purpose than report content/decoration. The majority of the master data elements were imposed on the system by the Delegated Regulation (Art. 33(2)) and EMVO does not have the history to know why the master data in that article is so rich in content. Your regulatory authorities should be able to provide the background and guidance. 6.09 What has been updated in the latest version of the Master Data Guide? The amendments of this new version of the Master Data Guide mostly focuses on the common and market specific master data sections. With respect to Common Master Data, numerous changes have been brought to better direct the information sources available. The language of submission has also been better defined. With regards to Market Specific Data, clarifications have been brought on data sources and entry requirements. The latest version of the EMVS Master Data Guide is available in our Documents Overview. 6.10 Why not all countries are listed in appendix 4 of the Master Data Guide? Appendix 4 of the Master Data Guide does not cover countries who made the decision of including the reimbursement number into the datamatrix code. 6.11 Who is a designated wholesaler? A designated wholesaler is a wholesaler designated by the marketing authorisation holder, by means of a written contract, to store and distribute the products covered by his marketing authorisation on his behalf. Consequently, a ‘Designated Wholesaler’ is neither the manufacturer, nor the Marketing Authorization Holder (MAH) nor a wholesaler buying from the manufacturer or MAH. A detailed presentation related to designated wholesaler is available in our Documents Overview. 6.12 Is designated wholesaler obliged to verify the authenticity of the unique identifier of medicinal products? No, the designated wholesaler is not obliged to verify the authenticity of the unique identifier of medicinal products. The Delegated Regulation sets out in which cases a wholesaler is obliged to verify the authenticity of the unique identifier of medicinal products. Consequently, wholesalers are not obliged to verify the authenticity of the unique identifier of products that they have received from the manufacturer or the MAH or a wholesaler properly designated under Article 20(b) Delegated Regulation ("designated wholesaler"). 6.13 What is a Sales Affiliate of a MAH? A Sales Affiliate of a MAH is a company focussing on sales which is controlled by the MAH or which is a subject to control by the same legal entity as the MAH. Affiliates should be considered as proxies of the MAH and should not be listed as ‘Designated Wholesaler’. ‘Affiliate’ means a company or legal entity that is effectively controlled by another or associated with others under common ownership or control. A detailed presentation related to Sales Affiliate of MAH is available in our Documents Overview. 6.14 What is a Co-Marketer? A Co-Marketer is a company commercializing a product under a different trademark. As co-marketers commercialise the product under a different trademark, they have their own marketing authorisation, different from that of the MAH. Therefore, Co-marketers are considered as MAH in their own right and should not be listed as ‘Designated Wholesaler’. A detailed presentation related to Co-Marketer is available in our Documents Overview. 7.01 Can a CMO connect directly to the EMVS? No, CMO’s have no contractual relationship with the EMVS and thus are not permitted to upload data. Uploaded data is also always attributed to the party who uploads it and for a CMO the data they produce will need to be attributed to the party employing them – aka the OBP. Thus, a direct connection for a CMO will not function technically or contractually. 7.02 How does a CMO get serialisation data into the EMVS? There are two options to fix this. The CMO can send the data to the OBP and let the OBP upload it directly. The OBP can create an account for the CMO using a Gateway provider (e.g. the EMVO-Gateway). 7.03 Can a CMO upload master data? No, unless the OBP has allowed a facility to do this. This is described in the following FAQ. 7.04 Who is legally responsible for data placed into the system that was initially generated by a CMO? The OBP who owns the account under which the data was uploaded. Data upload is always the responsibility of the connection owner (OBP). 7.05 Should serialization data be uploaded by the Marketing Authorization Holder (MAH) or could be uploaded by a Contract Manufacturing Organization (CMO) delegated by MAH? Each On-boarding Partner gets one connection to the EU Hub so there will be no connection of CMOs to the EU Hub. Delegation under certain circumstances is possible but only when delegated under the full control of the On-boarding Partner, EMVO does not grant access for 3rd parties acting as delegates. 7.06 How can a 3PL connect to the NMVS? Every 3PL can connect to the national repository system in the countries in which the 3PL hold a wholesale distribution authorization. If this is not the case, the 3PL can only operate through the credentials of the MAH it represents and only for the products the 3PL holds the contract with the MAH. 7.07 Can a 3PL connect directly to the European Hub? No, not currently. However, a 3PL could use facilities provided by the OBP and upload data via the OBP – e.g. a gateway connection. 7.08 Can a 3PL connect directly to multiple national systems where they operate as a multi-national distribution center? Technically yes, however this will potentially involve the development of multiple interfaces (for the different technical implementations of national system) however this is likely to be entirely dependent on whether the 3PL has a wholesaler license in each of the markets they wish to connect with. 7.09 Can a 3PL use the EPCIS standard to upload data to the EMVS? No, not directly however if the OBP has internal systems that support EPCIS and that are also connected with the EMVS, it would be possible for the OBP to support this. Download the Questions and Answers V 13.0 on "Safety Features for Medical Products for Human Use". Document published by the European Commission. Please find more information on this topic on the Website of the European Commission here: https://ec.europa.eu/health/human-use/falsified_medicines_en. Download the Delegated Regulation (EU) 2016/161 in English. Download the document from the EU server in other languages here. Download the Directive 2011/62/EU (FMD) in English. Download the document from the EU server in other languages here. Guideline for EMVO and NMVO stakeholders: Recommendations for alert handling and prevention process. Member States Coding Requirements. Document published by the European Commission. Member States position on the extension of the scope of the UI/ATD. Document published by the European Commission. Application of Article 23: Wholesalers to decommission on behalf of persons authorised or entitled to supply medicines to the public. Document published by the European Commission. Please find the latest version of the NMVO Fee Models Overview Table here. Please find the latest version of the NMVO Fee Models Overview Presentation here. 2019/01/25 | Malta NMVS connected to the EU Hub! 2018/11/05 | British NMVS connected to the EU Hub Production Environment! 2018/09/11 | Polish NMVS connected to the EU Hub! 2018/09/10 | Spanish NMVS connected to the EU Hub Production Environment! 2018/09/05 | French NMVS connected to the EU Hub! 2018/09/03 | Romanian NMVS connected to the EU Hub! 2018/07/12 | Portuguese NMVS connected to the EU Hub! 2018/07/12 | Hungarian NMVS connected to the EU Hub! 2018/06/26 | Cyprus MVS connected to the EU Hub! 2018/06/20 | Belgium and Luxembourg are connected in the EU Hub PRD! 2018/06/19 | Dutch NMVS connected to the EU Hub! 2018/06/18 | Norwegian NMVS connected to the EU Hub! 2018/06/18 | Finnish NMVS connected to the EU Hub! 2018/05/16 | Icelandic NMVS connected to the EU Hub! 2018/04/26 | Czech NMVS connected to the EU Hub! 2018/04/20 | Lithuanian NMVS connected to the EU Hub! 2018/04/18 | Bulgarian NMVS connected to the EU Hub! 2018/04/10 | Irish NMVS connected to the EU Hub! 2018/04/10 | Swedish NMVS connected to the EU Hub! 2018/04/11 | Danish NMVS connected to the EU Hub! 2018/04/06 | Slovenian NMVS connected to the EU Hub! 2018/03/12 | 500 Participation Agreements signed! This training video has been created for pharmaceutical companies that have to connect to the European Hub for the purpose of serialization of their product, established in the Falsified Medicines Directive of the European Commission (2011/62/EU). This training video has been created for pharmaceutical companies that have to connect to the European Hub for the purpose of serialization of their product, established in the Falsified Medicines Directive of the European Commission (2011/62/EU). This video will allow the On-boarding Partners to get acquainted with the steps and requirements related to the Technical On-boarding. Furthermore, it will show you a practical example and provide you with guidance throughout the Technical On-boarding process. This is a description of EMVO On-boarding Partners (OBPs). Please view this clip to make sure you are eligible before starting the On-boarding Process to the European Medicines Verification Organisation (EMVO) and the EU Hub.